On behalf of the Azure Data Box team, I’m thrilled to share with you some new solutions for our customers’ data movement needs. Starting today, we are adding online capabilities to the Data Box family with two exciting new products – Azure Data Box Edge and Azure Data Box Gateway. For offline transfer we know customers have all different sizes of data to move, so we’re also introducing the 1 PB Azure Data Box Heavy to go along with Azure Data Box and Azure Data Box Disk. And last but certainly not least, Data Box is now generally available! Customers are increasingly creating and processing data at the edge. You’re deploying IoT, remote energy exploration, traffic management, and other data-intensive scenarios in record amounts, all of which are massively accelerating edge deployments. Based on your needs, we created Data Box Edge, an on-premises appliance with AI-enabled edge compute capabilities. Data Box Edge acts as a storage gateway, creating a link between your site and Azure storage. This makes moving data into and out of Azure storage as easy as working with a local network share. Data Box Edge provides a local cache and optimizes network traffic to and from the cloud. 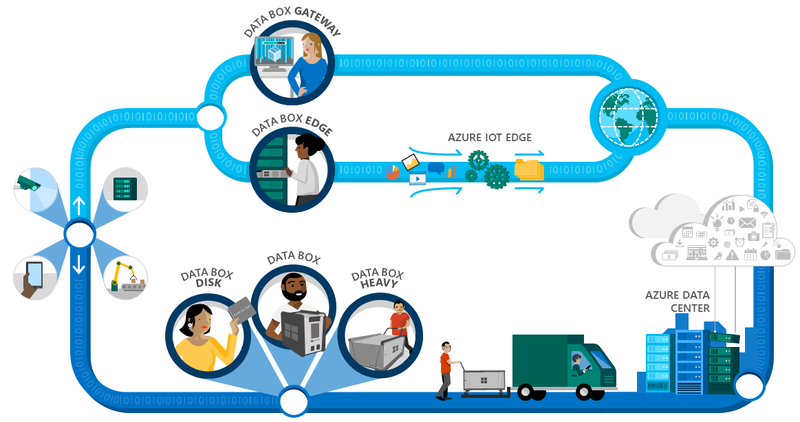 Data Box Edge also provides a computing platform via IoT Edge, which lets you deploy Azure services and custom code and applications to the edge. This means that you can analyze, filter, or transform your data right at the edge as part of your workflow. And to accelerate machine-learning workloads, Data Box Edge will have FPGA option powered by Microsoft’s Project Brainwave. For customers interested in deploying the storage gateway functionality on their own systems, we are also releasing the Data Box Gateway as a standalone virtual appliance. Data Box Edge and Data Box Gateway are both available in Preview starting today. If you are interested in participating, you can sign up here. For the last several months, we've been working directly with customers on these new products. Cree, an innovator of power and radio frequency semiconductors, turned to Azure Data Box edge to archive millions of quality-control photos from their manufacturing process. Cree uses the edge computing capabilities of Data Box Edge to package all the images for a part into an archival file, which simplifies future retrieval and management of the data. With all their data in Azure, Cree plans to improve their manufacturing efficiency by using Azure Machine Learning to develop a model that can run locally on Data Box Edge to identify bad parts in real time as they are produced. We continue to get requests about moving truly massive amounts of data. As in petabyte-sized data. (Trust me, we aren’t complaining.) We hear you loud and clear - you need to move this data securely and simply…and quickly! Enter Data Box Heavy, basically a one petabyte version of Data Box. The inspiration for Data Box Heavy’s name came from heavy-lift launch vehicles, which are designed to lift massive payloads into space. 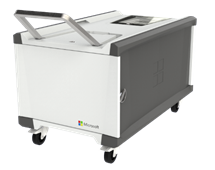 In a similar spirit, Data Box Heavy is designed to lift massive data payloads into Azure. Data Box Heavy’s one petabyte of raw capacity and multiple 40 Gbps connectors mean that a datacenter’s worth of data can be moved into Azure in a few weeks’ time. Data Box Heavy is available for pre-ordering in preview, effective today. If you are interested in Data Box Heavy, sign up here. We’re excited to say our preview is complete and Data Box has reached general availability for the US and EU! The Data Box Team would like to sincerely thank our partners and customers who provided their insight during the Preview phase and helped make Data Box a truly great product. Now that you’ve heard about our expanding Data box family, I invite you to come by our Ignite Booth and see them in person! Our product experts would love to answer your questions. They can even show you how to sign up to get a preview version of Data Box Edge, Heavy or Disk, or the final version of the Data Box. Ready to get moving with our products for offline transfer? Sign up here. Want to be a part of our previews for online transfer? Sign up here. Learn more about our family of products at http://azure.com/DataBox.